As ferry operators search for efficiency to reduce pollutants and operating costs, the importance of design, quality construction, and efficient propulsion become ever more important. Such is clearly the case with the Netherlands-based ferry operator Rederij Doeksen, whose two BMT Nigel Gee designed ferries are currently under construction at Strategic Marine’s Vietnam yard for operations between Harlingen on the mainland and the islands of Terschelling and Vlieland. in the Netherlands’ Wadden Sea. As this is a UNESCO world heritage site, there was a strong incentive to minimize any environmental impact. The all–aluminum 70-meter catamarans did not have speed as their primary objective however the rounded efficient underwater profile allowed an increase from 12 knots for the present ferry to 14 knots for the new vessel without increased wake in the shallow sea. Rederij Doeksen Managing Director Paul Melles explained the design selection process for the ferries at the recent Interferry Confernce. Apart from wake discomfort to the many small pleasure boats that sail this world heritage site, there is also a concern to avoid eroding the sand banks that line much of the shore. The new ferries, each with a capacity for 592 passengers and 66 cars, are nearing completion at Strategic Marine’s Vietnam shipyard. They will then be loaded onto a heavy lift ship together and delivered to the Netherlands. At that point their interiors and all components will be complete, the LNG tanks will be installed and, except for engines, they will be ready to go. The pure LNG engines from MTU will be installed via soft patches on the vehicle deck over the engine compartments, after the boats arrive in Europe. 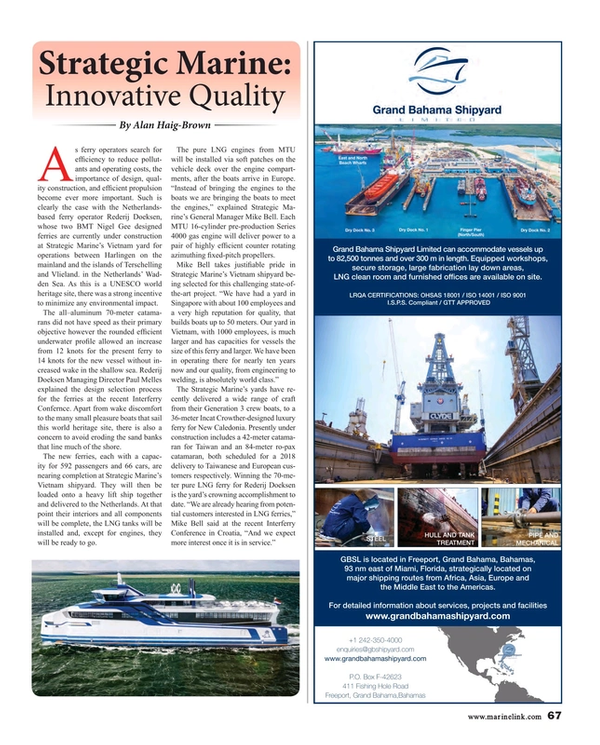 “Instead of bringing the engines to the boats we are bringing the boats to meet the engines,” explained Strategic Marine’s General Manager Mike Bell. Each MTU 16-cylinder pre-production Series 4000 gas engine will deliver power to a pair of highly efficient counter rotating azimuthing fixed-pitch propellers.